Today I received an email from Angie Spade, Jessica Phelps’ cousin and the keeper of her public memory. The 21st anniversary of her abduction and murder is coming up July 1, and this reminder is well warranted. 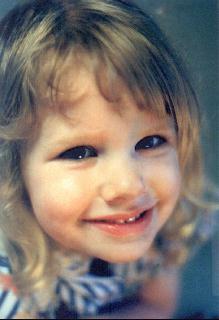 On July 1, 1997, Jessica Phelps wandered out of her home in Flint, Genesee County, MI. 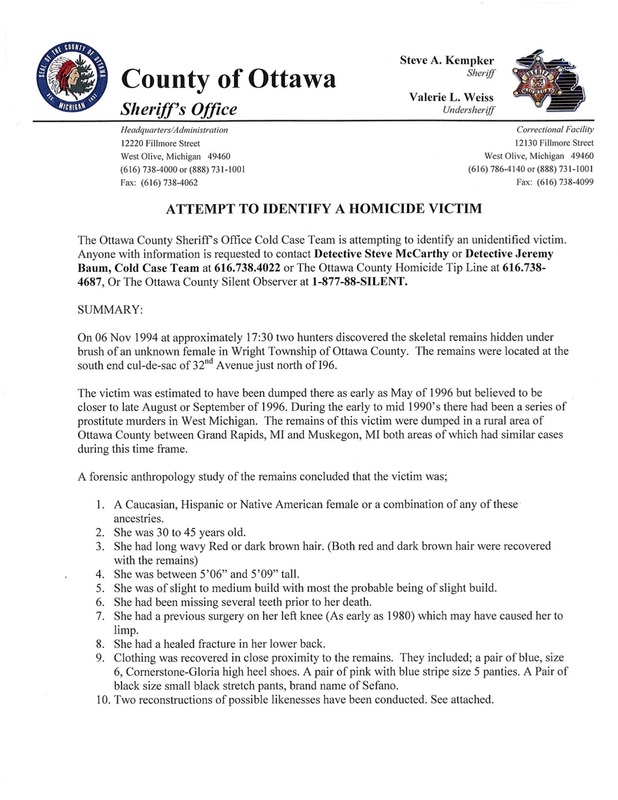 Her body was found in an Atlas Township culvert on April 2, 1998. And here is the Justice for Jessica Phelps Facebook page. Somebody knows what happened to Jessica. Now, how do you reach that person? May 11, 2018 — Is Arthur Ream the one? Captain Roger Van Liere of the Holland Police Department is retiring today. There is likely to be no party or cake; that’s just not his way. I hope to drive down a dozen donuts. It’s likely he won’t eat ’em, but he might pass them about. Roger is very special to me. He was one of the team members who worked so diligently to crack the Janet Chandler murder. With Rob Borowski (also of the HPD), and David Van Lopick, Michael Jaffrey, and Geoffrey Flohr of the Michigan State Police, Roger stayed the course for almost two years. There were times, he’s said, when he and he team members would come home from interviews and their families would have to scrape the crud from their souls, so toxic was this investigation. These investigations are never conducted in a vacuum; there is always spill over, always a price to be paid. The support staff for these investigators also face the same kind of nastiness, even at second hand. I think of their administrative assistant, Cheryl Achterhof, and their supervisors John Kruithof of the HPD and John Slenk of the MSP. Both of the latter also have retired. As it turned out, there WAS a party that day for Roger. 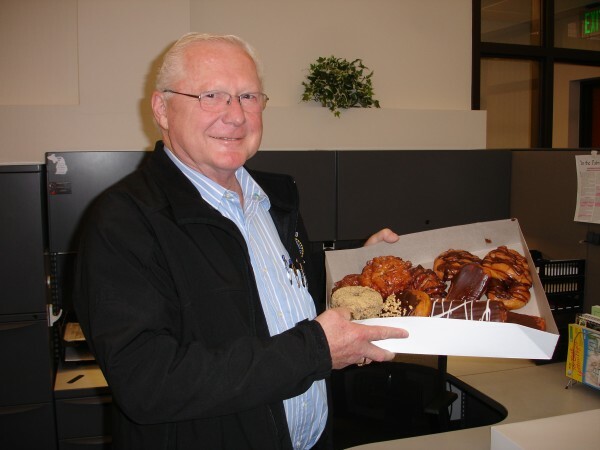 I was not there, but I did manage to get those donuts down to him for the day. Here was the Holland Sentinel coverage at his retirement. Yes, well done good and faithful servant. The world is much better for his having been in it. By accident I managed to catch the episode of Betrayed last night on Investigation Discovery. The show chronicled the 1979 murder of Janet Chandler via a highly speculative first-person point of view. We were supposedly hearing Janet’s postmortem thoughts about what was going on and how long she had yet to live or her descriptions of how she died. The show was not good, but not as bad as it might have been. It could have been as ugly at the case itself; the producers toned down a lot of what actually happened. We were approached last year about taking part in this, as were all the primary investigating officers, the prosecutors (Assistant Attorney General and Ottawa County), the family. Janet’s family wanted nothing more to do with this and certainly didn’t want her death to wind up as entertainment. All the rest of us respected that and we declined. So, the producers went searching far and wide and scooped up mostly peripheral players. A “friend.” A “teacher” (certainly not from Hope College). Lt. John Slenk (retired), who had served as the commander for the Michigan State Police had the lion’s share of time and was most knowledgeable. And we heard from Bob DeVries, who had been the public information officer in 2003 when he and I first talked about the case. At the time he was preparing to leave the Holland Police Department to take over as chief in Kingman, Arizona. I had been meeting with him and some of my broadcast journalism students to talk about the complicated relationship between police officers and reporters. When he said he was leaving after 30 years, I asked him if there was one that got away. Janet Chandler. “That’s the case that keeps us all awake at night.” I had the impression that he was passing it over (he was long gone by the time the cold-case team got to work in 2004). The result was the result: the film, the cold-case investigation, the arrests, pleas and prosecutions. Finally, the producers tossed in Rich Harrold, a former managing editor and reporter with the Holland Sentinel. Rich was certainly not around when Janet was abducted and murdered. He came to Holland in the early ’90s from Mt Pleasant. (He and I both had the honor of editing the Morning Sun there in different decades.) And he left shortly after the trial concluded. I viewed his participation in the Betrayed show with coolness. There were many things factually correct about the show. After all, John Slenk had his recollection and probably some records. And there was the film we made, the Dateline piece produced by Jack Cloherty after the trial, all the news coverage, and the material on this website. But there were lots of mistakes, little ones, that cropped up when the storytellers were trying to put together a cogent narrative. They were jarring and discordant. For one, you can bet the police talked with Carl Paiva long before he left town (per the show). So, now it’s entertainment. I’m sure the producers would assert that it’s a production with the purpose: the dangers young women face and the relentless pursuit of justice by law enforcement. Both of those things were true in this case. And in keeping with the premise of the show, Janet Chandler was absolutely betrayed by people she trusted. But never lose sight of the fact that the true purpose of the show is to keep eyes on the screen so that somebody makes money. The hope is that the one person who know something can tell them what they need to know. At this point they are looking for one person: Bev Schippers. If you know of her, her whereabouts, either use the page to private message the team or call Det. Jeremy Baum: (616) 738-4018. The audio documentary is the work of Nina Innsted of Detroit who has done this work: http://www.alreadygonepodcast.com/author/admin/. November 24, 2017 — Are there serial killers out there? Well, yes, and maybe more than we know. Thomas K. Hargrove, founder and chairman of the Murder Accountability Project, is the subject of a fascinating story in last week’s New Yorker Magazine. The story, by Alec Wilkinson, makes the case that by using vast amounts of data, carefully gathered and skillfully analyzed, that Hargrove and his associates can make the case for identifying areas where serial killers have been at work–some for decades. Hargrove has said there may be many more than we realized. Further, the data from MAP often can find links among crimes and clusters of crimes. MAP also keeps updated statistics on murders. The 2016 numbers are here. So, murders are up and the percentage of solved complaints is at an all-time low. Worst major city in the nation? Detroit at 14 percent. Wow! Of course, the site notes, Chicago does NOT report, even though it had the highest number of murders: 765. That’s more than two a day. While Detroit led the way in terms of the nation’s lack of clearances, the whole of Michigan didn’t fare all that well: 597 homicides, of which only 188 were cleared. That’s a 31.49 percent rate. So if you commit murder in Michigan you have more than a two-thirds chance of getting away with it. Nationwide, the clearance is 55.54 percent. I’m thinking we could do better. How? It’s simple: people have to speak up and tell what they know. And then police need to listen and act. Certainly there are cases of departments not wanting to hear from some number cruncher…The New Yorker article talks of at least one specific agency–Lake County, Indiana–where Hargroves’ identification of serial killer activity went unwelcomed and unheeded. But the officers I know very definitely WANT to hear and are ready and willing to act on it. But it takes somebody who will not buy into the “Snitches get Stiches” mentality. Courage? Yeah. And I believe people have more of it than they may know. This news was so welcome: arrests of those who police and prosecutors believe are responsible for the murder of Erik Cross. This report by WWMT lays it out. 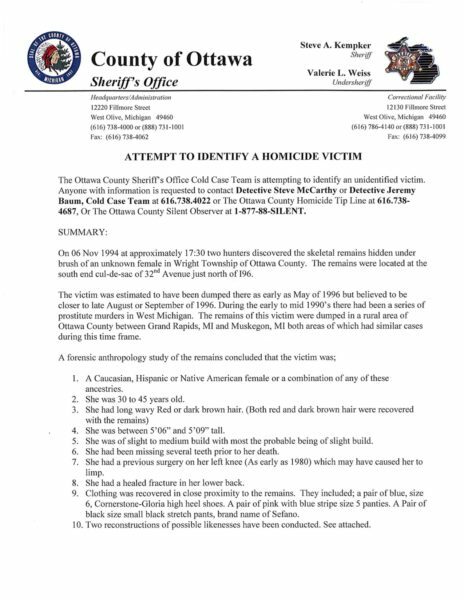 There is a long way to go still on this case, but this likely represents a beginning of the conclusion of this story and a chance to justice for this 16-year-old.